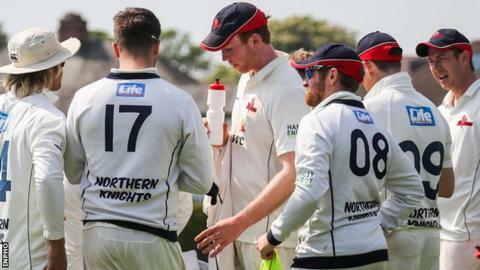 Leinster Lightning produced an improved batting performance in their second innings against Ulster Knights to keep their unbeaten Inter-pro record. Determined to not repeat their first innings collapse, Lightning batted with resolve on a placid Contarf pitch. North Down leg-spinner Jacob Mulder (2-62) struck twice in the morning session to offer the Knights some hope. But Lightning skipper John Anderson and Simmi Singh negotiated the final two sessions with a century partnership. Despite following on from a first innings deficit of 294 runs, Leinster were never in trouble as Anderson and Singh produced the best partnership of the match with an undefeated 146. Only two wickets fell all day as the home team accumulated 221 in 91 overs.